Three years ago we announced the second publicly available major version of the framework. CUBA 6 was the game-changing version — the licensing was turned from proprietary to Apache 2.0. Those days we couldn't even guess where it was going to bring the framework in long term. CUBA community started to grow exponentially, so we have learned a lot of possible (and sometimes impossible) ways of how developers use the framework. 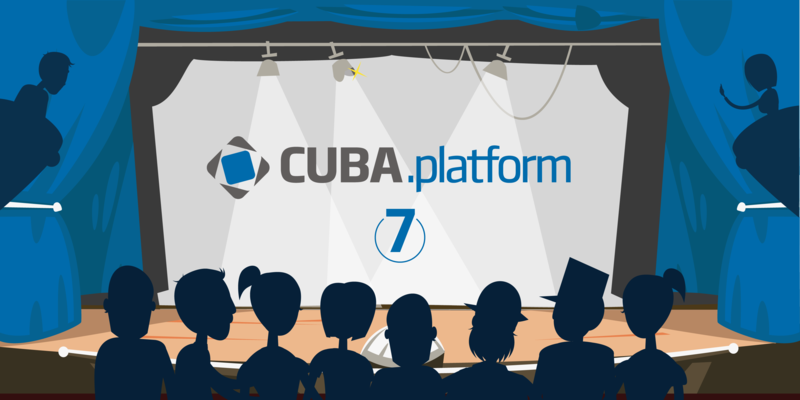 Now we are happy to announce CUBA 7, which, we hope, will make development more coherent and joyful for all community members from those just starting their journey in CUBA and Java to skilled enterprise developers and Java experts. Obviously, a great part of CUBA success we owe to CUBA Studio. It has remarkably simplified the overwrought Java enterprise routine, in many places grounding it down to making trivial configurations in the visual designers: no need to know Persistence API or Gradle or even Spring to develop a complete and feature rich CRUD application — Studio will do it for you. First of all, Studio was not a fully featured IDE, so developers had to switch between the Studio and IntelliJ IDEA or Eclipse to develop business logic and benefit from convenient navigation, code completion and other essential things, which was annoying. Secondly, this magical simplicity was built over massive source code parsing and generation. Improving the code generation capabilities would mean moving towards development of a fully featured IDE — a too ambitious undertaking. We decided to lean on another giant's shoulder to overcome these limitations. Studio was merged into IntelliJ IDEA by JetBrains. 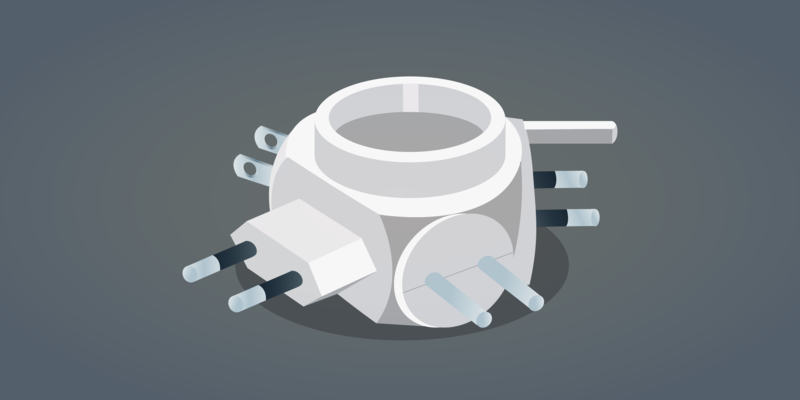 Now you can install it as a plugin for your IntelliJ IDEA or download as a separate standalone bundle. Currently new Studio is under active development: we are porting features from the old version. The short term plan is also to re-implement web based designers using native IntelliJ UI and improve project navigation experience. Traditionally, the underlying stack has also been majorly upgraded, e.g. Java 8/11, Vaadin 8, Spring 5. Upgrade to Vaadin 8 was a big challenge because of massive breaking changes in the Vaadin data binding API. Fortunately, CUBA abstracts developers from Vaadin internals by wrapping it into its own API layer. CUBA team did a great job reimplementing internals keeping its own API untouched. This means that compatibility is fully saved and you can benefit from Vaadin 8 right after migrating a project to CUBA 7 without any refactoring. The full list of updated dependencies is available in the official release notes. Since the first thousand members joined our community we realized how wide the variety of requirements for "standard" CRUD screens is — way beyond the initially-designed set of features. Nevertheless, for a long time we were able to handle requests for custom behavior even without an API layer — thanks to another first stage assumption — Open Inheritance. Effectively Open Inheritance means that you can override any public or protected method of an underlying class to tailor its behavior to what you need. This might sound like a cure for all diseases, but in fact it doesn't give you even a short-term contract: what if the overridden method will be renamed, deleted or simply never used in the future versions of the framework? 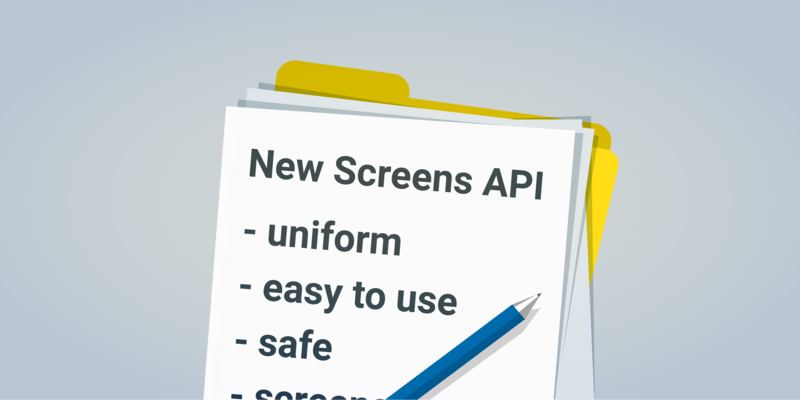 So, in response to the growing demand from the community we decided to introduce a new screens API. The API provides clear and long-term extension points with no hidden declarative magic, flexible and very easy to use. Screen descriptor becomes a complementary part instead of mandatory. The layout can be created programmatically or declared as an xml screen descriptor, which is defined by the @UiDescriptor annotation over the controller class. This makes controllers and layouting much easier to read and understand — this approach is very similar to the one used in Android development. Before, it was also required to register a screen descriptor in the web-screens.xml file and assign an identifier to it. In CUBA 7 this file is kept due to compatibility reasons, however, creating screens in a new way does not require such registration. Comparing new API with the old approach you can see that we are not overriding hook-methods, which are obscurely called in the hierarchy of parent classes, but define logic in clear predefined points of the screen lifecycle. In the previous section we learned how to subscribe to the lifecycle events, so, what about other components? Should we still scatter all required listeners on screen initialization as it was in 6.x versions? The new API is very uniform, so subscribing to other events is absolutely similar to the lifecycle ones. By clicking the button we call middleware service returning a number, which goes to the currency field. The currency field should change its style depending on the price value. In the example above we can see two event handlers: one is invoked when the button is clicked and another one gets executed when the currency field changes its value — as simple as that. In fact we delegate validation logic from our currency field to the currencyFieldValidator method in our screen. This might look a bit complicated, however, developers adopt this feature surprisingly fast. ScreenBuilders combines fluent factories to generate standard lookups, editors and custom screens. The example below shows how you can open one screen from another. Note, that the build() method returns the screen instance of the right type, without a need to unsafely cast it. Screens component provides a lower level abstraction to creating and showing screens rather than ScreenBuilders. It also provides access to the information about all opened screens in your CUBA application (Screens#getOpenedScreens) in case if you need to iterate through them. 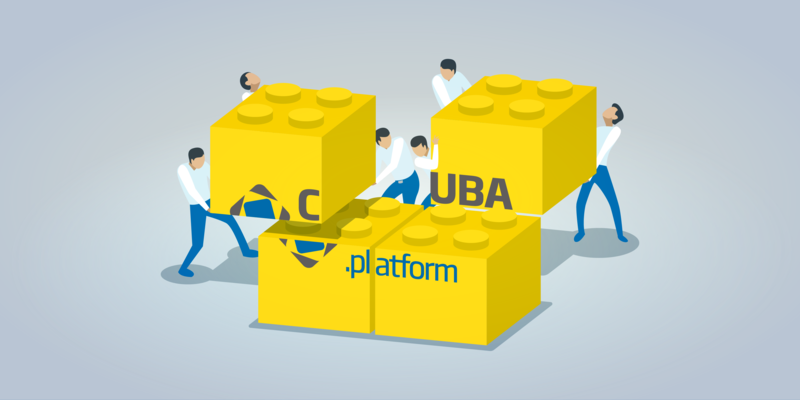 CUBA enables extremely fast development of backoffice UIs not only by providing advanced visual tooling with extensive code-generation capabilities, but also by a rich set of data-aware components available right out of the box. Such components just need to know what data they work with and the rest will be managed automatically, e.g. lookup lists, picker fields, various grids with CRUD operations and so on. Data loader is a data provider for data containers. Data loaders don't keep data, they just pass all required query parameters to a data store and feed data containers with the resulting data set. Data container keeps the loaded data (a single entity or a number of entities) and provides it to the data-aware components in a reactive manner: all changes of the wrapped entities get exposed to the corresponding UI components and visa versa, all changes in the UI components will lead to the corresponding changes in its data container. Data context is a powerful data modification manager that tracks changes and commits all modified entities. An entity can be merged into a data context, so it will provide a copy of the original entity with the only, but very important difference: all modifications of the resulting entity and all entities it references (including collections) will be tracked, stored and committed accordingly. Data components can be declared in screen descriptors or instantiated programmatically using a specialized factory — DataComponents. URL History and Navigation. This feature solves a very common problem of SPA with “go back” button in a web browser, provides an easy way to assign routes to application screens and enables an API to reflect a current state of a screen in its URL. Form instead of FieldGroup. 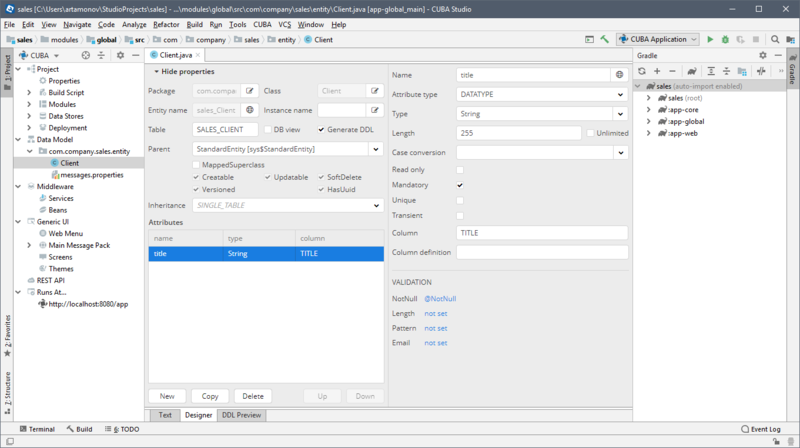 FieldGroup is a data-aware component to show and modify fields of a single entity. It infers the actual UI shown for a field in runtime. In other words, if you have a Date field in your entity it will be shown as a DateField. However, if you would like to operate with this field programmatically, you will need to inject this field to the screen controller and cast it to the right type manually (DateField in our example). Later on we change our field type to some other and our application crashes at runtime… Form addresses this issue by explicit field type declaration. Find more information about this new component here. HTML / CSS attributes now can be easily defined right from the xml screen descriptor or set programmatically. Find more information here. The previous block about the new screens API was larger than I expected, so in this section I'll try to be neat! Entity Changed Event is a Spring application event that is fired when your entity made its way to a data store, got physically inserted and is within an inch of being committed. Here you can provide some additional checks (e.g. check product availability in stock before confirming an order) and modify it (e.g. recalculate totals) right before it will be visible for other transactions (of course with read committed isolation level). You can also use this event as the last chance to interrupt the transaction from being committed by throwing an exception — which might be useful in some corner cases. There is also a way to catch the Entity Changed Event right after commit has happened. Follow this chapter of the documentation to see an example. It can join existing transaction (in case it is called under transactional context) or create its own transaction. It has no commit method, but there is the save method, which doesn't lead to immediate commit, but waits until the attached transaction will be committed. Find an example of using it here. Finally, CUBA 7 supports JPA lifecycle callbacks. To not replicate a well-written information about what these callbacks can be used for, let me just share this link, which fully covers the subject. We have also provided adapters for the old data binding, which keep working for the old fashioned screens. 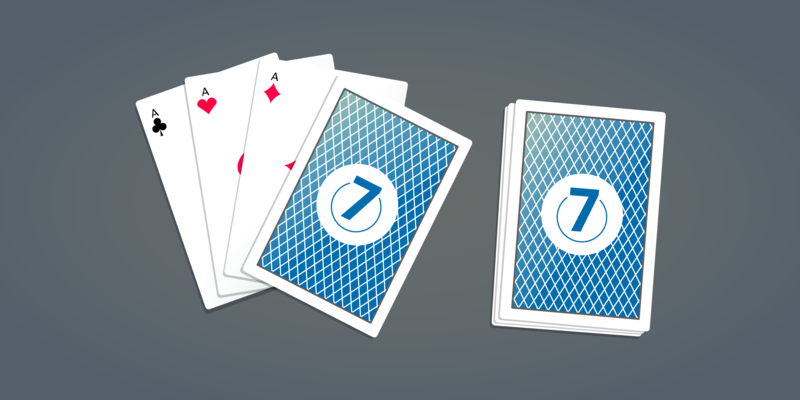 So, good news, the migration path from version 6 to 7 should be quite straightforward. Reporting, BPM, Charts and Maps and Full text search addons are now free and open source. Please not that for 6.x and older versions of the Platform and Studio licensing terms remain the same! Finally, let me thank the community members again for all the support and feedback. I hope you will love version 7! The full list of changes is traditionally available in the release notes.